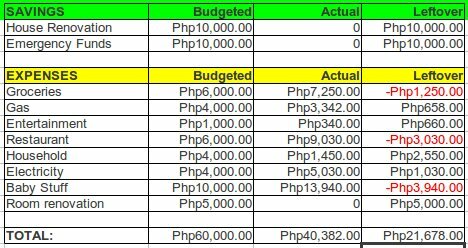 Three things happened last April that shaped that month’s budget: (1) I celebrated my birthday / baby shower; (2) I got slapped with a Php500 penalty when my savings account dipped below the average daily balance (ADB); and (3) the bonuses I was relying on were delayed. The birthday accounted for the extra groceries, in fact I even cheated a bit and didn’t include the other party expenses (ooops!) because I didn’t create a category for them in the original budget. Which now brings me to how I set up the budget plan. I’m deciding if I should also include all our utilities or to at least lump the fixed ones in one category, instead of just accounting for our electricity consumption. And should I include EVERYTHING we spent on for the month? Or maybe that’s already too overreaching? Hmmm….I’ll have to put on my thinking cap for this. I was counting on the bonuses to help me kickstart our house renovation funds and resume socking money in our emergency funds. But they only came yesterday, so our savings will begin this month. Promise. Once again, we went above our restaurant budget. With Bean’s birth this month, I doubt we’ll be able to eat out as often, so maybe we’ll finally be able to stay within budget this month. Crossing fingers. Speaking of giving birth, my mom’s my OB and the unwritten doctor’s code says that doctors’ kids get all sorts of ridiculous discounts. According to my mom we should prepare around Php10,000 for the hospital fees, a pittance when compared to the usual Php50,000 to Php60,000 for normal deliveries in most hospitals. Yay mom! Wow! In contrast, we got billed an additional 10K because the professional fee in the package was "lower than their usual"
True, but I've also rendered my fair share of free legal advice, affidavit drafting and pro bono services, so it all works out neatly in the end.